The places where the action of the novel takes place do not appear by chance. In some cases, become another character. Its symbolism and the particular history of each one accompanies the protagonists in their adventure. These are some of them. Opened in 1883, it sits on the south-facing side of the Montjuic mountain. It is known for the beauty of its mausoleums, and for being the final resting place of the great number of distinguished people from the city. Since its construction, it has taken people from all social classes and distinctions. At the end of the 19th century, penniless people were buried in mass graves, the rich built ostentatious pantheons, while the remaining middleclass had family niches. 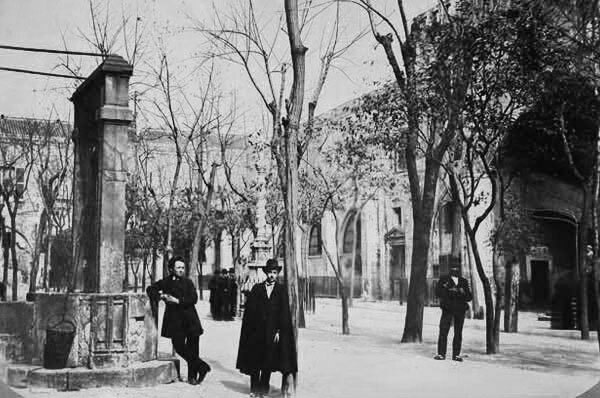 Today, the cemetery remains very similar to the one Caralt and Irene would have experienced in their time, and there are organized tours within Barcelona’s cemeteries trails. Built in 1760 by Ventura Rodriguez to host the Royal Surgery College, only the second in Spain. It’s a good example of the city’s neoclassic architecture, among which the magnificent anatomic amphitheater—designed by Gimbernat—also stands out. At first, the main purpose of the college was to train military surgeons, although it didn’t take long before it was serving the civil population as well. In 1843, medical and surgical degree qualifications were combined, and the college became the Faculty of Medical Sciences (for two years it was also the school for pharmacists). Along with the Santa Creu Hospital, the Faculty’s settings allowed students to practice assiduously thanks to the excellent teaching. It could take more than four hundred students, although it had serious capacity problems until the faculty transferred to another building in 1906. After many changes, in 1929 it turned into the definitive location of the Royal Academy of Medicine of Catalonia, such as we know it today. You can still visit the amphitheater. A Gothic building dating from the 15th century, designed by Guillem d’Abriell. It was built with the idea of bringing the city’s hospitals together in one place. 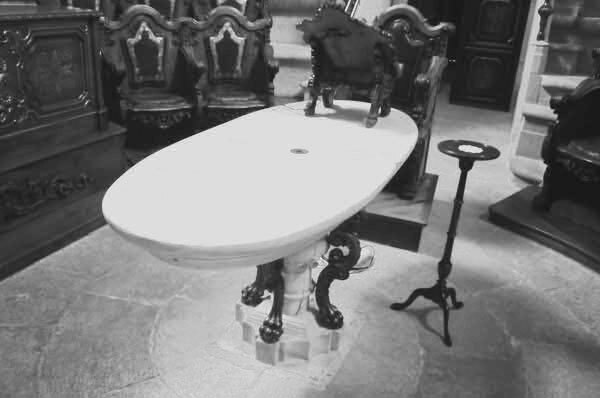 King Martín I of Aragon presided over the setting of the first stone in 1401. The building was planned following a famous oriental model, with four wings over two floors, each constructed around an entrance courtyard. During the 16th century, one of the wings was demolished to accommodate another entrance courtyard connecting the existing one, and where today we still find the imposing staircase up to the Catalonian Library. The complex of buildings includes a small church and the old hospital archive. 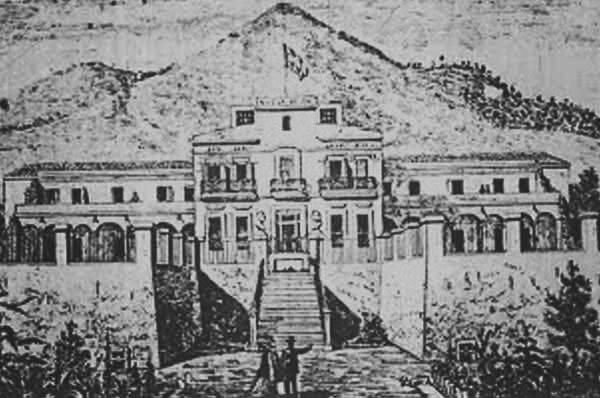 At the end of the 19th century, the city’s rapid growth and new advances in medicine and hygiene meant that the hospital was oversubscribed, and the decision was made to relocate it to new grounds: Santa Cruz and San Pablo Hospital. Currently, the hospital facilities include the Catalonia Library, The Institute for Catalan Studies, The Massana School, and two public libraries as part of the Barcelona Council. In 1931 it was pronounced an Historic and Artistic Monument of National Interest. Founded in 1857 in the Gràcia neighbourhood, and moved in 1867 to Sant Gervasi. 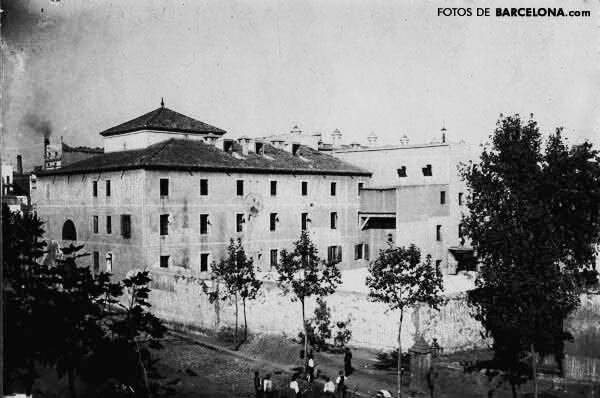 For decades during the second half of the 19th century, Nueva Belén was the foremost centre in Catalonia and Barcelona for psychiatric care and research. The five-hectare estate had a garden, small plots for growing food, vineyards, and woods. The building combined a central administrative section and two wings, separating female from male patients. Joan Giné i Partagás was the director until his death in 1903. During this period, the psychiatric hospital earned prestige for being the only school for phrenology. The first free psychiatry school developed here. In 1998, the complex of buildings was demolished to allow the expansion of the CosmoCaixa Museum. Also called The Old Prison, it was located in the old convent of San Vicente monks, in the current Folch and Torres Square. It could hold 287 prisoners, although in its first years of operation it held nearly a thousand inmates. Space was so scarce that life mainly revolved around the courtyard and the children lived together with the adults. Living conditions in Amàlia Prison were terrible. The total lack of hygiene, a very strict regimen, the corruption of the officials, the scarcity and poor quality of food, among other things, made this place one of the most miserable and terrifying places in Barcelona. Built in the old de Sants Marine, the hippodrome was constructed along with other small fisherman’s villages scattered along the coastal area. It opened in 1883 in the presence of mayor Francesc Rius y Taulet, and other of the city’s luminaries. Among its facilities were offices, betting stands, restaurants, lavatories and dressing rooms for jockeys. 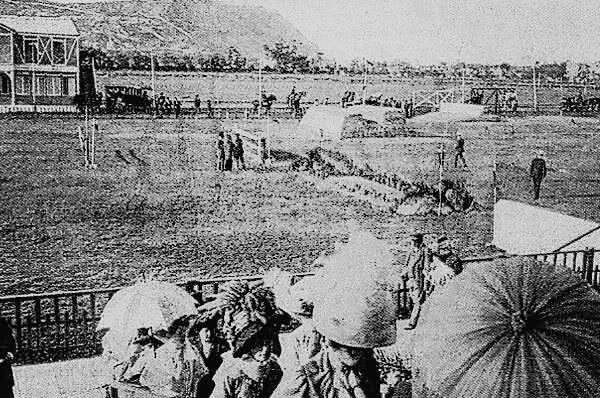 The grandstand terraces were organized in categories: one was called Real, which was for to Alfonso XIII’s team, another was for the members of the Círculo Ecuestre or Riding Circle, and another was reserved for women. The general public occupied the poorer terraces. It became farming land after it fell into disuse. In 1907, the first plane to fly over Catalonia took off from the Hippodrome. The first bullring, built in Barcelona by Josep Fontserè i Domènech and commissioned by la Casa de la Caridad (Charity House). Opened in 1834 in the Barceloneta neighbourhood, it was founded on the land formerly belonging to the city’s slaughterhouse. Exactly a year after the opening, a particularly infuriating bullfight for the public triggered one of the most infamous revolts in Barcelona, in which convents and churches were burned down. 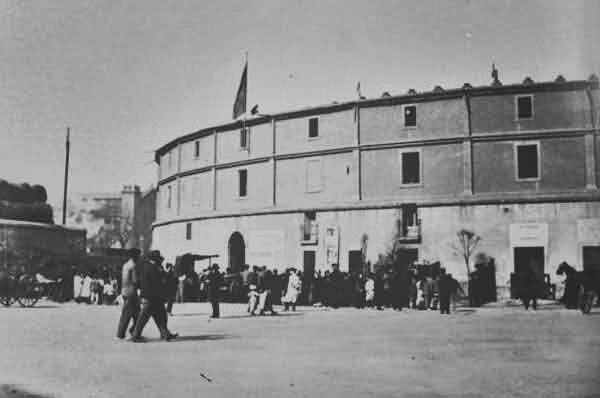 Pedro Aixelá Peroy had his initiation fight in this bullring, being the first Catalan bullfighter to do so. Torin closed in 1923 and was demolished in 1944. Today, the monolith of the Natural Gas company headquarters stands on the land where the bullring once was. Also called Teatro Lírico-Sala Beethoven. 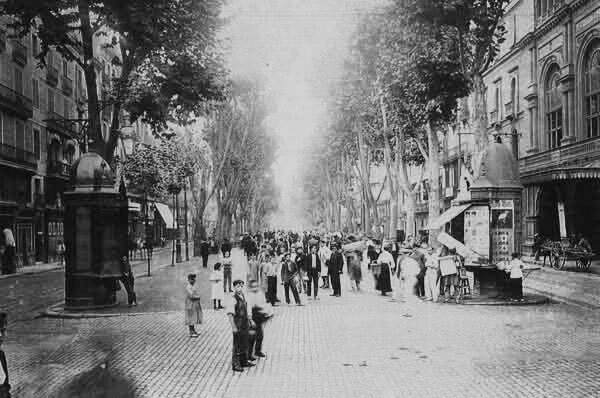 It was located in what today is the corner of calle Mallorca and Pau Claris. It opened in 1881 with a capacity for 2000 people, 850 of which could be seated in the stalls. In terms of lavishness and magnificence, it was seconded in Barcelona only to the Liceo theatre. In 1881, Bizet’s Carmen premiered here. In 1889 Gluck’s Orpheus and Eurydice was restaged, and in 1890 Alceste by the same author was also premiered. In 1888, Julián Gayarre performed there, and in 1899 the 15-year-old soprano María Barrientos had her debut. In addition, Vincent d’Indy, Mathieu Crickboom, Camille Saint-Saëns, and Richard Strauss acted as orchestra directors. 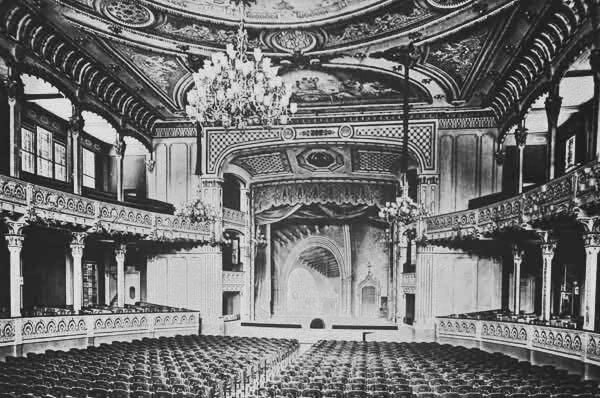 Many recitals and concerts by prestigious solo artists took place in the theatre, such as the pianists Isaac Albéniz, Enrique Granados, Joaquim Malats, and Carles Vidiella, or the violinists Eugène Ysaye, Ernest Chausson, and Pablo Sarasate. It also put on plays, and the actress Sarah Bernhardt (“the most famous actress the world has ever known”)performed there (The Lady of the Camellias, Adriana Lecouvreur). The theatre hosted the premieres of L’alegria que passa by Santiago Rusiñol (1899), Silenci (1898), Blancaflor (1899), and La culpable (1900) by Adrià Gual, and La Rosons y Picarol by Enric Morera (1901). The Lyric also staged ballets, parties, and a wide range of celebrations. It closed in 1900. The neighborhood was constructed during the 18th century for the residents of the Ribera neighborhood who had been displaced by the construction of the Ciudadela of Barcelona. The neighborhood is roughly triangular, bordered by the Mediterranean Sea, the Moll d’Espanya of Port Vell, and the El Born neighborhood. The neighborhood is serviced by its own stop on the Barcelona Metro. Torre Sant Sebastià is the terminus of the Port Vell Aerial Tramway; opened in 1931, it connects La Barceloneta with Montjuïc across Port Vell. 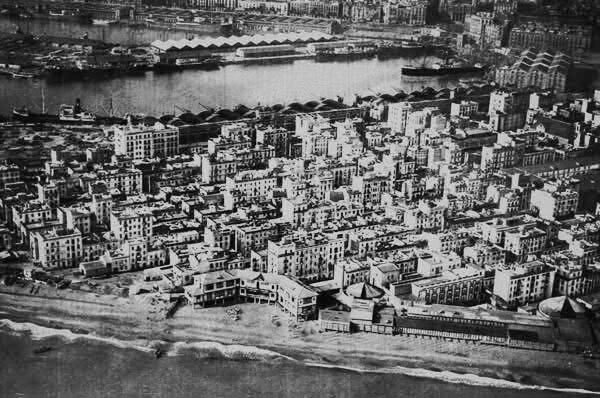 La Barceloneta is known for its sandy beach (which made an appearance in Don Quixote, book 2) and its many restaurants and nightclubs along the boardwalk. During the nineteenth century there was a major industrial development with large factories as Talleres Alexandre or la Maquinista Terrestre y Marítima. Barcelona’s avenue par excellence, linking la Plaza de Cataluña (Catalonia Square), the city’s central nervous system, and the port where you find Columbus’ monument. The plural in its name is due to the fact that it is divided into different sections: Canaletes, Estudis, Sant Josep, Caputxins and Santa Mónica. Since its construction, it has been the typical meeting place and social hub for Barcelona’s residents, so it’s no surprise that a number of diverse and important buildings run along its course; these include, the Virreina Palace, La Boquería Market or El Liceo. It has always brimmed with kiosks, cafeterias, restaurants, and shops; the only change is the type of commerce found there, which has moved according to the times. Today, an invasion of tourists has somewhat lessened the Ramblas original charm and changed its function, but it still is a must-see destination when in town. Café Europa, the Zurich, the café de les 7 portes and the chocolate shop el Mallorquín are some of the gastronomic spots that appear in the novel, and which still exist today, although changed. 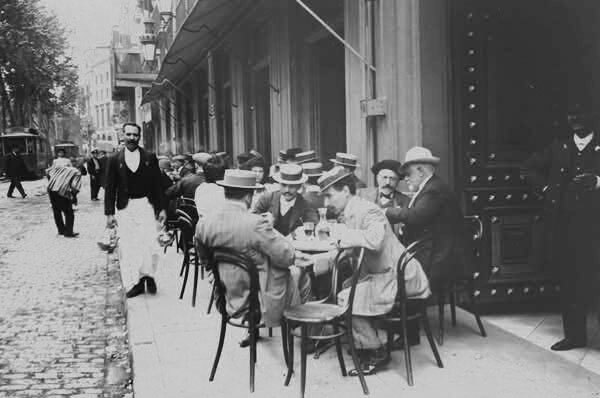 At the end of the 19th century, cafes, restaurants bar and pubs played an important role in life as the places where people convened to converse and debate. You can imagine the atmosphere in these locales, filled with smoke and the sound of clinking glasses and bottles; the whispered conversations and the cries and heckles about politics, economy and the latest news from the city. 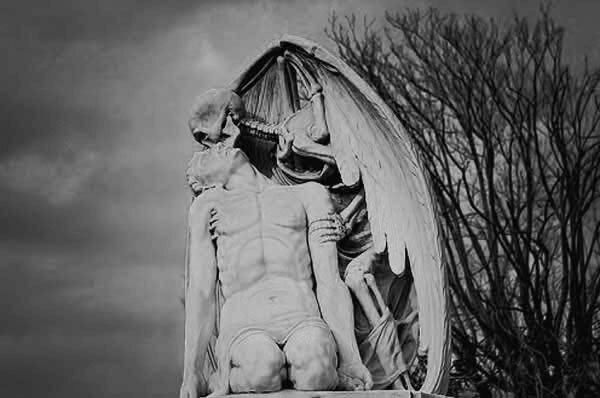 © 2019 El Secreto de Vesalio. All Rights Reserved.